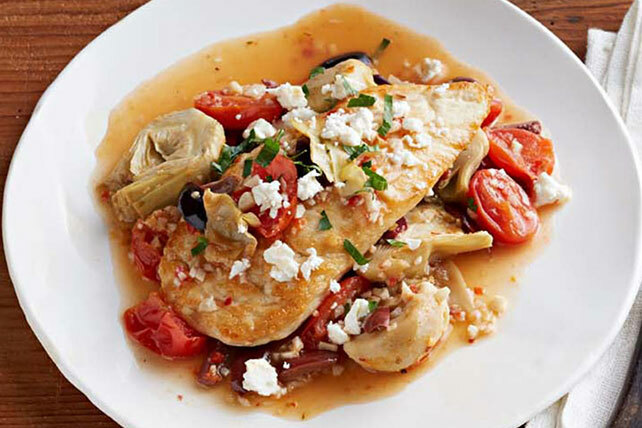 Create a masterpiece tonight with our One-Pan Artichoke Chicken Provençal. Our elegant One-Pan Artichoke Chicken Provençal won't even dirty many dishes. Cook chicken in large deep skillet sprayed with cooking spray on medium-high heat 2 min. on each side or until evenly browned on both sides. Remove from skillet; cover to keep warm. Combine all remaining ingredients except cheese in skillet. Bring to boil. Return chicken to skillet; cover. Simmer on medium-low heat 6 to 8 min. or until chicken is done (165ºF). Garnish with 2 Tbsp. chopped fresh parsley before serving.